Amazon launched its popular Prime subscription service in India. From, last three years Amazon is here to capture the market share from Flipkart and Snapdeal. And the E-commerce i.e. giant has been successful in attracting the consumers. As Amazon India saw growth in its customers and to increase them they launched Amazon Prime. 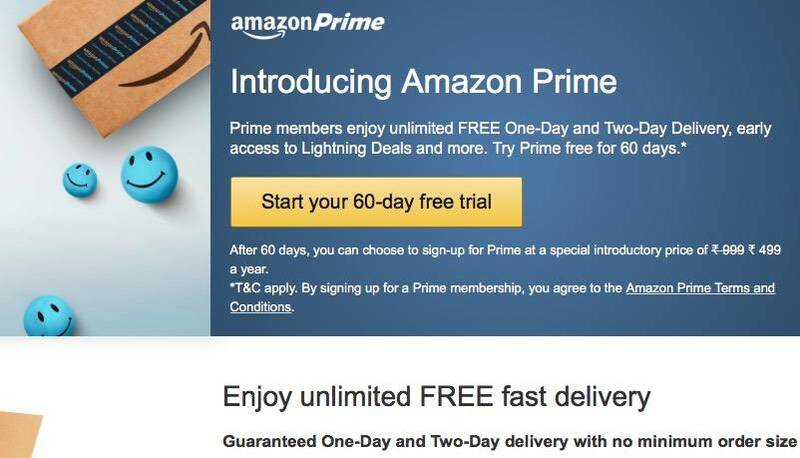 In short, ‘Amazon Prime = Amazon fulfilled + Free fast delivery’. This might be a big blow to Flipkart as Flipkart also launched service like Prime i.e. Flipkart First in 2014 but it haven’t received any popularity. What is Amazon Prime and what benefits Indian Prime users will get? Amazon Prime users will get Free Shipping for anything they order without maintaining any price level. They will be able to get access to new deals 30 minutes earlier than Normal customers. They will also get delivery in 2-3 days for free. Those who will buy this service will also get access to Amazon Prime Videos. It includes original and exclusive shows as well as popular movies. Jeff Bezos said that this service will include Indian original content too which is one of the most good reason for buying Amazon Prime Service. Amazon Prime subscription will cost Rs 499 per year if they use this service from now and they will also get 60 days free trail period. The original Prime subscription price would be Rs 999. But wait something you should read before registering is that Every product isn’t eligible for Prime and you will have to check a Prime Logo against the product. Amit Agrawal, VP of Amazon India said ‘With Prime, guaranteed one-day delivery becomes an everyday experience instead of an occasional indulgence, and with no minimum purchases, it provides unlimited convenience all year long’. Finally, in India we are observing a tough competition in E Commerce sector. Important thing to note is that due to this tough competition ‘Indian Consumers are winning’.